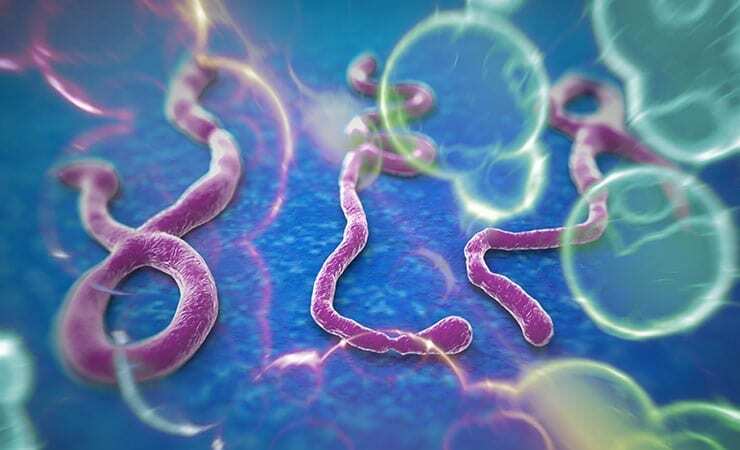 Analysis of clinical samples from suspected Lassa fever cases in Sierra Leone showed that about two-thirds of the patients had been exposed to other emerging diseases, and nearly nine percent tested positive for Ebola virus. The findings, published in this month’s edition of Emerging Infectious Diseases, demonstrates that Ebola virus has been circulating in the region since at least 2006—well before the current outbreak. First author Randal J. Schoepp, Ph.D., recently returned from Liberia and Sierra Leone, where he spent six weeks helping to set up an Ebola testing laboratory and training local personnel to run diagnostic tests on suspected Ebola hemorrhagic fever clinical samples. He is part of a team from the U.S. Army Medical Research Institute of Infectious Diseases (USAMRIID) that has been providing assistance to the Ebola outbreak in West Africa since March. Three other USAMRIID personnel also have been involved in this ongoing effort: Wes Carter, who traveled with Schoepp to Liberia; Aileen O’Hearn, Ph.D., who recently returned from providing laboratory support to Kenema Government Hospital (KGH) in Sierra Leone; and Matthew Voorhees, who is currently onsite at KGH. USAMRIID has been working in the region since 2006, when it began a collaborative project to develop and refine diagnostic tests for the Lassa fever virus endemic to Sierra Leone, Liberia and Guinea. As those assays have matured, the scientists have begun to optimize additional tests for a number of emerging diseases. According to the publication’s authors, between 500 and 700 samples are submitted each year to the KGH Lassa Diagnostic Laboratory in Sierra Leone. Generally, only 30 to 40 percent of the samples test positive for Lassa fever, so the aim of this study was to determine which other viruses had been causing serious illnesses in the region. Using assays developed at USAMRIID that detect the presence of IgM, an early protein produced by the body to ward off infection, the research team found evidence of dengue fever, West Nile, yellow fever, Rift Valley fever, chikungunya, Ebola, and Marburg viruses in the samples collected between 2006 and 2008. In addition, of the samples that tested positive for Ebola, the vast majority reacted to the Zaire strain, which was unexpected, according to the authors. The laboratory testing site in Kenema is supported by the Armed Forces Health Surveillance Center-Global Emerging Infections Surveillance and Response System. In collaboration with the host country, the site enables collection of samples that can be used in research toward new medical countermeasures, and allows USAMRIID to evaluate the performance of previously developed laboratory tests using samples collected on-site. The Institute hopes to eventually obtain viral isolates for medical countermeasure development and receive data on the performance of the diagnostic assays. In addition to providing laboratory testing and training support for the current outbreak, USAMRIID has provided more than 10,000 Ebola assays to support laboratory capabilities in Sierra Leone and Liberia. The Institute also supplied personal protective equipment to Metabiota Inc., a non-government organization (NGO) involved in the testing. Other contributors to the work include the Department of Defense Joint Program Executive Office-Critical Reagents Program, the Defense Threat Reduction Agency (DTRA) Cooperative Biological Engagement Program, and the DTRA Joint Science and Technology Office. Read the study at Emerging Infectious Diseases : Undiagnosed acute viral febrile illnesses, Sierra Leone. Source: US Army Medical Research Institute of Infectious Diseases, adapted.